Silhouetted against an impossibly starry sky, quiver trees watch as the Large and Small Magellanic Cloud galaxies pass overhead. Of the many ‘firsts’ I experienced in 2015 one of the most memorable was trying astrophotography for the first time. It is very different to low-light or night-time photography in urban areas and requires different techniques and post-processing. 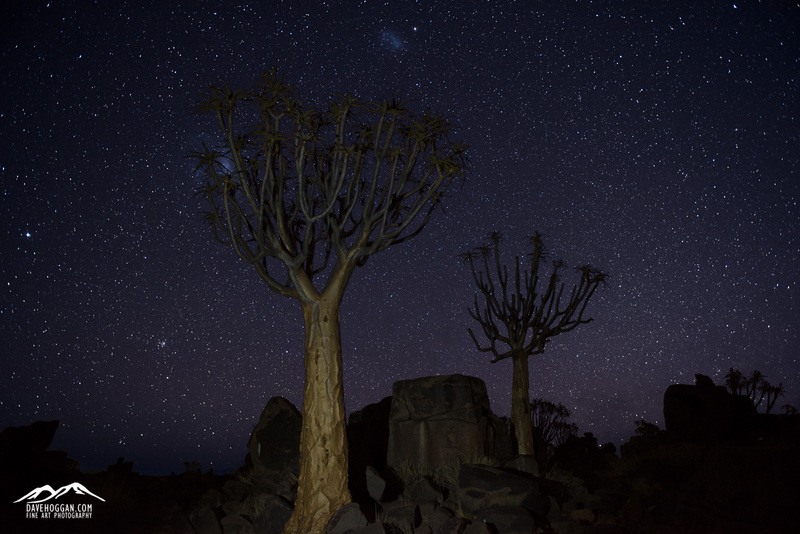 However, with a good teacher in the form of Emil from Nature’s Light by the second night we were turning in worthy shots like the one of Namibia’s quiver trees above. One of the other firsts was that, for the first time in my travels, we got lost. The evening started out in what was to be an ongoing theme during the trip: a late afternoon shoot followed by relaxed on-location snacks and beer, waiting as the twilight turned to darkness and the canopy of starts made their appearance. If you’ve never experienced what a truly light-polution-free sky looks like then be ready for a shock. Human eyes a far more sensitive and for every star you see in photographs and movies, the eye sees a dozen more. It is, quite simply, both staggering and humbling. But we were there with a purpose and so the aim was to head away from the 4WD, set up one camera on a tripod with an intervalometer to take the 12-15 four-minute shots needed for a star trail and then walk away to another location to take the more standard astrophotography shots. We couldn’t do both near each other as the light painting we would be doing for the standard shots would ruin the star trails. A simple plan. The problem was that, despite only walking around 200 metres from the 4WD, we got lost on the way back. To be fair it was easy to do. The quiver tree forest was on a gently undulating hill with no extensive line-of-sight and consisted mainly of trees and rocks. The usual ‘turn left at the tree’ directions weren’t really much help and as it was only a couple of hundred metres in an almost straight line we didn’t bother using GPS or a compass. After an hour of trying to get back to the 4WD, we perhaps were regretting that decision. We were never in any real danger of course. We were, quite literally the only people for miles around and the only animals we may have come across would have been jackals, which would have to have been monumentally desperate to attack three humans. The temperature was not going to drop below a very comfortable 20°C or so and rain was absolutely not going to happen. The worst would have been a sprained ankle but at the speed we were going that would have been bad luck. Still, we were losing photography time! Eventually we made it back to the 4WD (having never being more than a few hundred metres from it) by which time the star trail shots had completed. By the time we returned from collecting the cameras we had 30 minutes or so of actual photography time left so it was a bit of a mad dash to find a decent composition set up and take the necessary shots, of which the photograph above is the result. Every time I see this shot it takes me back to the aimless wandering in that quiver tree forest and palpable feeling of relief as the 4WD finally came into view. And I smile at the memory. 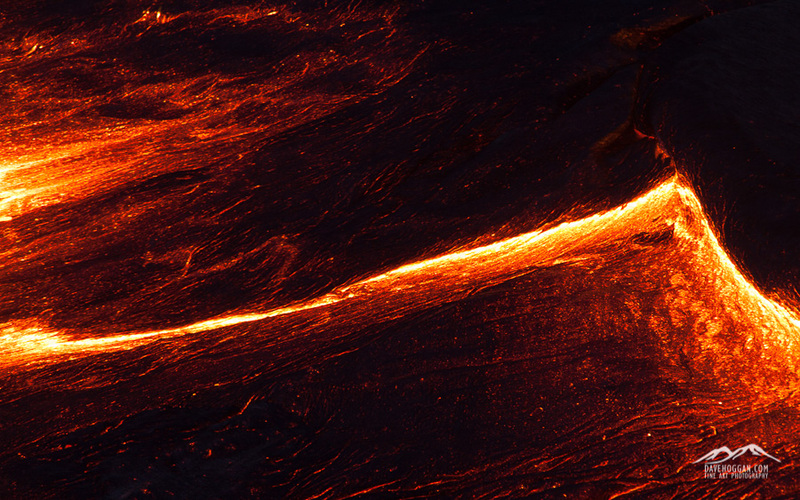 The ever-changing surface of the lava lake at Erta Ale guarantees that you’ll never take the same shot twice. But be warned; staring at the lake’s surface can become almost hypnotic. It has been very quiet around here for a few weeks simply because work has been insanely busy. I’m an IT security professional by day and right now I’m currently managing two projects that are well underway and all my time is split between them with the thousand different technical and operational queries that clients raise during the deployment phase. All my other work therefore has to fit into the gaps and the evenings. Of course there is always a benefit to being so busy and one is that I have been working on one client’s site or another over the past few weekends and the travel fund has slowly been growing! So, despite feeling a little weary right now I do have something to look forward to: the next photography trip! As mentioned in a previous post, Siberia is planned for 2017. The photographer running that – Alexey Trofimov – has suggested dates around the end of February and so whilst I’m really excited about working alongside him I need something a bit sooner. The next option is to return to Iceland. I have an image in my head that I can’t get rid of and so I can see a week or two spent driving along the southern coast. 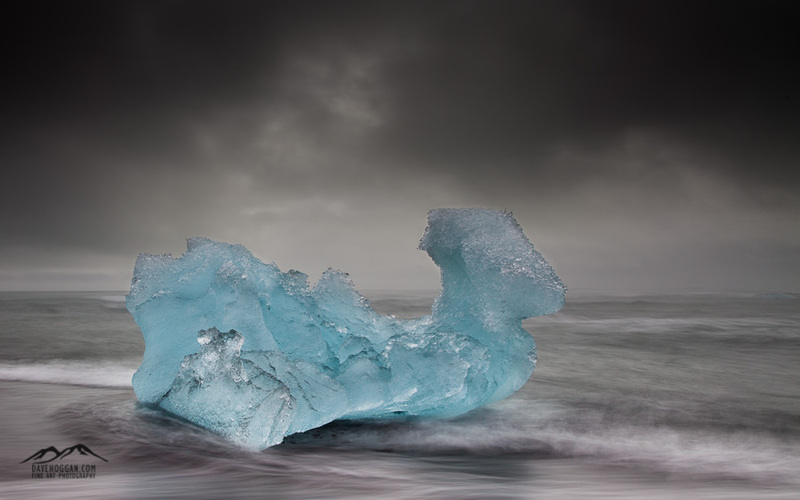 Iceland is an easy trip; one I really do not have to think about but again, I want to go late in the year, when it is colder – perhaps November or early December. Again, I can’t wait. So, the current plan is 18 days travelling through Java on a volcano hunt. The people who organised the trip to Ethiopia, Volcano Discovery, have a photographer-centric trip in September and over the past few weeks I’ve been talking to them about adding a custom extension. If all goes well I should be climbing Krakatoa in just under 80 days! After the heat of Java’s volcanoes Iceland will be a nice halfway-house before the -25°C expected in Siberia.